Impression ESL 11A is part of the sextet of top-end floorstanding loudspeakers (as well as a duo of centre-channel speakers) that form MartinLogan’s Masterpiece Series. This is a series with true scope, ranging from the Classic ESL9 fully passive model, through the trio of models optionally equipped with Anthem Room Correction (including this one) right up to the mighty CLX ART and Neolith flagship designs. These are electrostatic statements of intent, limited only by budgetary and room size concerns. The Impression ESL 11A is perhaps the most interesting of all of these designs for those without Reference Class wallet dynamics, because of where it ultimately takes the electrostatic panel. As the name suggests, the ESL 11A features an 11” (279mm) wide XStat curved electrostatic panel to cover the midrange and treble. It’s joined to a dynamic active bass cabinet, sporting twin 203mm drivers and a pair of 275W Class D amplifiers. 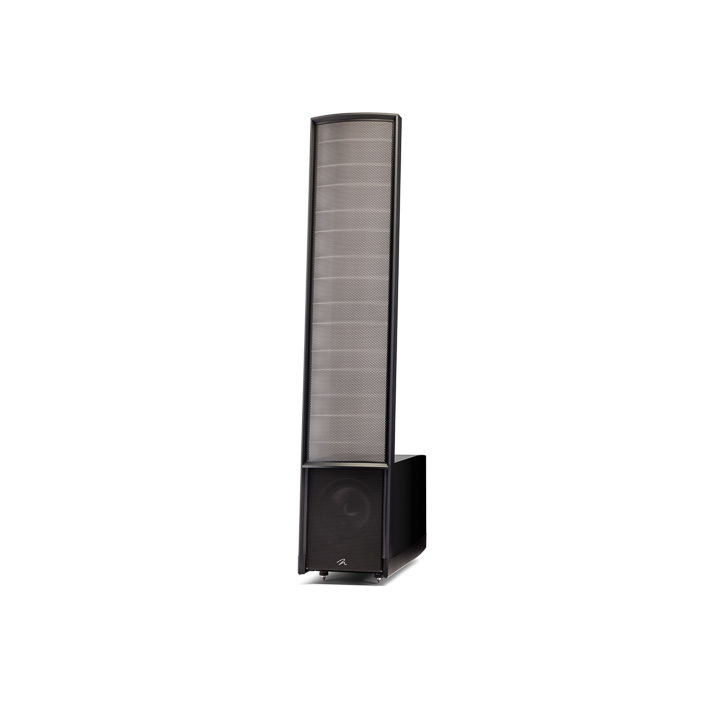 Its size allows the Impression ESL 11A to be used in the kind of smaller listening rooms that often don’t accommodate electrostatic designs because of their footprint, although the normal amounts of breathing space needed behind a stator panel does usually preclude their use in small rooms. This is where things get interesting. The middle trio of Masterpieces – the Impression ESL 11A, the Expression ESL 13A, and the Renaissance ESL 15A – all include a 24-bit Vojtko DSP engine in place of a crossover, and come with an option to include ARC (Anthem Room Correction). This is a small cardboard box called a PBK (Perfect Bass Kit) and inside are instructions, measuring microphone, a microphone stand, and some long USB cables. By downloading a set of masterfiles from MartinLogan’s website, placing the microphones in a number of positions around the listening room, and then applying the results to that Vojtko DSP engine, you can create a better environment for your loudspeakers by matching the low end of the loudspeaker to the room itself. Notionally at least, you could conceivably squeeze a pair of the Renaissance models into a shoebox of a room and equalise it into sounding good, but I’d recommend exercising a modicum of balance, as those stator panels still need room to breathe no matter how well equalised the bass gets. But, it’s surpising just how well these speakers can now be accommodated in smaller rooms and that’s what makes the Impression ESL 11A so interesting, because its size and response now can lend themselves to placing MartinLogans in rooms that were hitherto off limits. We all benefit from that! In a way, this hits the target MartinLogan has been kind of aiming for. The company’s loudspeaker designs – CLX and Neolith excepted – are not as demanding on an amplifier as many high-end designs, and a smaller and comparatively affordable electrostatic loudspeaker, that is simultaneously ideal for unfussy amplifier partnership, and capable of being used in a very wide range of rooms, is hard to resist. It’s like the ‘everyman’ of high-end loudspeaker design.